Rewind to Trevor Noah’s Daily Show this past Halloween. The show is set during the presidential campaign. Not the 2016 one, but the 2020 one as Donald Trump “runs” for reelection. The setting is literally and figuratively underground as Noah surreptitiously tries to continue the comedy program that had had been wildly successful when the press was still free. As Noah goes from correspondent to correspondent, it is clear that America has become largely inhospitable to African-Americans, Hispanics, women, just about anyone who is not like Donald Trump. The program reveals (in hopefully a hyperbolic fashion) virtually everything that could go wrong in the first term of a Donald Trump presidency. But one thing has not happened. Nuclear war. It reminds me of the perils that the people of Russia, in fact the people of the entire world, live under so long as Vladimir Putin is president of the world’s second strongest nuclear power. Putin has committed a litany of outrageous violations of human rights, he has invaded sovereign countries, he has taken cyber mischief and espionage to unprecedented levels, but he has not unleashed his nuclear arsenal. 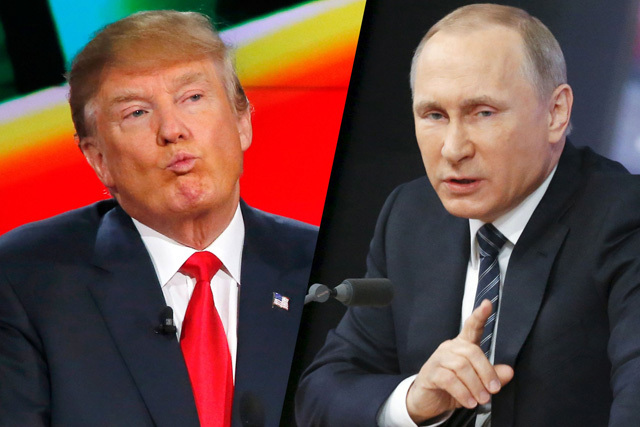 It is no small coincidence that Trump and Putin seem to have a mutual admiration society. They both love to take just about everything to the limit, with little regard for the actual or perceived consequences. Neither seems capable of admitting a mistake. Each seems to think that the entire world is against them. Each is someone whose presence in a room would make everyone else wary. Fast forward to now, three days after the Trevor Noah episode. The fear of a Trump presidency is only growing as the polls tighten and we are reminded of how in 1980 Ronald Reagan took a tight race the week before the election and turned it into a landslide victory for himself. Like Trump, the arguments against Reagan were that he was not ready for prime time, that he was not smart enough nor temperamentally fit to serve as president. Somehow as the clock ticked down to Election Day, there was a tsunami of sentiment that these fears were unfounded and Reagan became acceptable and then desired. Is that what is happening with Donald Trump now? It has been sixteen months since he announced his candidacy and he has said and done everything and more that is outrageous. For those of us who oppose Trump, he has given us an almost daily diet of words and actions that clearly demonstrate that he is the most unqualified person to receive the nomination of a major party in American history. But this seems to matter to fewer and fewer people. Could the unthinkable happen? On the day after the Cubs (deservedly) won the World Series, Trump seems primed to do what hardly anyone thought possible. I hope that I am wrong. I hope that the polls are flawed. I hope that the American people might be just a little bit wiser than I fear. But should the unthinkable happen, it might be the best we can hope for with a Trump presidency is “Putin-West.” Let’s hope that we never have to find out if that would be true.